Shiva of the East is a Character in Dark Souls. He is the assumed Second-in-Command of the Forest Hunter Covenant. He can be found standing next to the castle where Alvina lives, and he will give you some friendly advice if you speak to him after joining the Covenant. He is wearing the Eastern armor, a complete set of which can be found on the eastern edge of the cliff in the first part of the forest after the big sealed door. If you belong to the Hunter's Covenant, Shiva will appear as a merchant in Blighttown, standing next to the waterwheel. See the Merchants page for more information. Darkroot Garden - First encounter, after you join the Forest Hunter Covenant, he's located near the ruins entrance. He will tell you some background information on the Forest hunter covenant. His bodyguard is behind him. Blighttown - Afterwards, if he's not in Darkroot Garden, he becomes available as a merchant in the Blighttown swamp in front of the waterwheel elevator. However, you must still be a member of the Forest Covenant for him and his bodyguard to appear there. If you decide to kill Shiva and his bodyguard for their items after joining the covenant, you may have to break the covenant by attacking them in Blight town. I cancelled the covenant via Oswald and although Shiva vanished from the swamp, he didn't reappear in the forest. To make him reappear I had to rejoin the forest hunters. Located in Blighttown under the water wheel. In order for him to appear in Blighttown, you must first join the Forest Hunter's Covenant by talking to Alvina in the Darkroot Garden. You must talk to Shiva at the forest hunters base before he will appear in Blighttown and sell you his wares. Note: If you leave the covenant by any means, Shiva will no longer appear in Blighttown. Note: Shiva will reappear if you talk to Oswald of Carim, absolve your sins and rejoin the covenant. It was leaked he was going to be a much more evil character, due to the leaked info he was going to have a black eye orb. So either he was going to hunt the firekeeper in Queelag's Domain or he was going to kill Alvina and you had to rescue her soul. Either way you would have had to invade him to get something back from him. 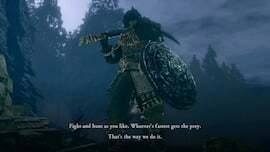 Another plausible thing would have been him taking the Covenant of Artorias ring from you and you having to invade him in New Londo. A third speculation was the after obtaining the Chaos Blade, Shiva would talk about it in envy and betray you by backstabbing you and killing you. This would then result in the loss of the Chaos Blade and in place of it, a Black Eye Orb was given to the player. To reobtain the chaos blade, you would have had to hunt Shiva down in the Painted World. After killing him, you would re-obtain your Chaos Blade, along with a soul of reprisal. Video Showing you how to get him as a merchant and more info. I've heard all about you. I'm Shiva of the East, captain of the brigade. Let's teach you the clan basics now, as there is no time to chat in the midst of fighting. Except there's little in the form of rules, you hear? Fight and hunt as you like. Whoever's fastest gets the prey. That's the way we do it. Only... Don't forget what Alvina said. Traitors aren't given a second chance, for any reason. That's about it, then. Don't worry, it's a good old time, isn't it? Great to have you with us. Good hunting to you. "I am shiva of the Friendzone"
"Note: If you leave the covenant by any means, Shiva will no longer appear in Blighttown." False. Just rejoined after abandoning, and Shiva was at the elevator below blighttown. Can&apos;t wait to learn his backstory in Sekiro. I believe he might have two bodyguards, since I killed his bodyguard in darkroot garden and got the ring, then saw another bodyguard behind him in blighttown. I’m playing the remastered version. Thanks to the Remastered Covernant changing system NOW you can kill him without angered Miss kitty. I decided to try and cheat the system by luring one of those weird things that use flame whip in blighttown and getting it to kill his bodyguard without aggroing Shiva. Spoilers: it doesn&apos;t work. Shiva still attacks you for it even though there is a flame-spewing monstrosity smacking him from behind. Doh well. More like Shiva the Deceased. I killed his bodyguard in the Darkroot Forest, absolved my sins, rejoined the covenant, then in Blighttown his bodyguard sometimes reappears behind him. Not sure if it&apos;s a glitch or not. Might try killing him again if I find him there and I&apos;ll see if he drops another Dark Wood Grain Ring. I can&apos;t find him in either location, even after I absolved my sins and rejoin the covenant. Does this mean I already kill him? any way to know for sure? When i kill him can i summon him?